The rose gold trend has been knocking around for a few years now and shows no signs of going anywhere - it's a colour that seems to suit every season. 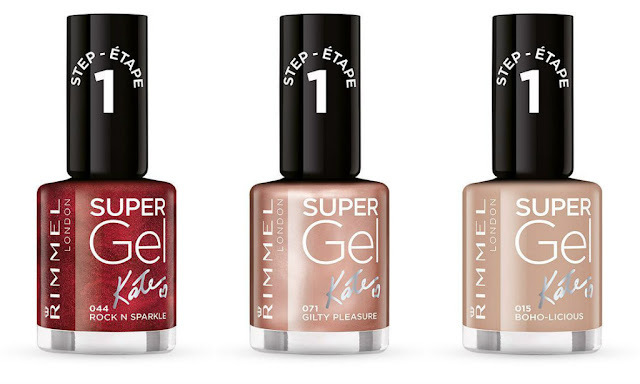 This Summer, Rimmel have released three new nail polishes and a small collection of lipstick in sleek rose gold packaging to celebrate their 15 year partnership with model Kate Moss. The one that caught my eye was that middle one, Gilty Pleasure. These are from the Super Gel range, which I haven't tried before. It's a two-step polish system, the first being the colour, the second a topcoat. I don't own the topcoat so I just used two coats of the colour in these pictures. I'm sure any topcoat would prolong the wear time, in my experience no rose gold colour lasts more than a day or two without a topcoat anyway, it tends to go very dull on its own. I dug out my other rose gold nail polishes to see how they compared, shade-wise. The Rimmel one (second from left) is very similar to Essie's cult shade Penny Talk (third from left). The Essie is slightly shinier, but there's not a huge difference on the nails. The Orly shades both have a bit of shimmer, and the Lacura one from Aldi is completely different on the colour wheel, it's more similar on the nails. The Rimmel 15 year anniversary products are available on stands now - I picked up a lipstick along with the nail polish for €6.95 and €7.95 respectively and got a free Bronzer, so keep an eye out on stands for special introductory offers. RRP on both polish and lipstick is €10.99, there's currently a Buy One Get One Half Price offer at Boots on Rimmel products. Some really nice rose gold colors from these brands! Oh my god the Aldi one is amazing! When did you get it? Is it still for sale I wonder I've never seen Nail Polish in the Adli near me and its a big enough store! These all look really nice, I think the problem though can be with my nails and how the metallic polishes can look on them, accentuating any imperfections. Love this! I'm a rose gold polish addict! Saying that I am missing some of the above so I need to rectify that. I did pick up one recently from Lidl!